Heron Point is a 18 hole resort golf course which is open to the public 364 days a year. The Golf Course winds through beautiful california Pine forest and quaint beach neighborhoods. Golfers often spot hawks, eagles, wild turkeys, fox deer and even alligators while playing the course. Willard Byrd’s exceptional design offers a challenging round. Plenty of water, bunkers and narrow fairways create a shot maker’s course. 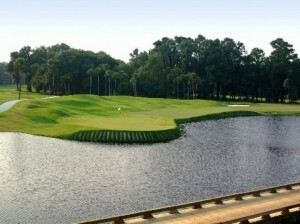 You are guaranteed to enjoy your round at one of the Myrtle beach ‘s exceptional golf courses. Rated 3.5 STARS for 2005 by Golf Digest and Best Bang for your Buck- 2005″ by Golf Magazine Heron Point challenges the advanced player, but also provides many scoring opportunities and is player-friendly for the novice golfer.